Frozen turkey? No problem. 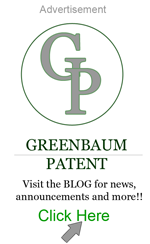 - Greenbaum P.C. Thanksgiving lore is filled with stories of frozen turkeys wreaking havoc on last-minute chefs. While there are techniques for rapidly thawing a turkey, they usually involve soaking the hypothermic bird in a large bucket or bathtub. For all of you who thought "there must be a better way..." I present patent application # 10/975242: A method of Cooking a Frozen Turkey. Enjoy and Happy Thanksgiving! A preferred embodiment of the present invention is a method of cooking a frozen whole turkey. The frozen whole turkey is preferably cooked in a bag resulting in evenly, thoroughly cooked turkey meat. Although the present invention is discussed with respect to a frozen whole turkey, it is recognized that other suitable types of meat such as, but not limited to, a frozen split bird (one leg, 1 wing, and ½ breast), a frozen pork roast, or a frozen beef roast could also be used. Therefore, the term “frozen whole turkey” may be interchanged with other suitable types of meat. Further, the more general term “bird” is used throughout to refer to the frozen whole turkey used in the preferred embodiment and may also be interchanged with other suitable types of meat.